I’m still exploring Hare Brain Tortoise Mind at a tortoise pace, and I came across this concept in it: Animals that live in highly stimulating environments grow bushier neurons in their brains. That is, the neurons develop more dendrites, make more connections with their neighbors, and become capable of new and varied patterns of interaction. They can get out of a rut. While she was here, she mentioned how odd it was to look down an alley and see not only a dirt alley with dumpsters, but also an explosion of murals—not graffiti, but murals. The town kept surprising her. And it can still surprise me. She’s right; there’s no pattern, unless the two blue-and-purple houses on my block constitute a pattern. But one has a moon goddess on it and the other has a Kokopelli. On the same block are trailers and the stucco-and-stick-fence gated wall of a spa that will never be built. For some reason, someone bought the lot quite a few years back and began construction, although you can’t build anything that size in this location. It’s a nice wall, though. Doing some volunteer work that takes me all over town, I recently discovered a section of Juniper Street I never knew existed. The street has three disconnected parts, and I’d only known about two of them. This third part is around a hidden curve. From there it suddenly drops down, becoming so steep no one could ever ride bike up it and so narrow you’d hate to meet another car on it. On one side is a great wall of wind-and-water-sculpted red dirt and on the other side, two residential streets, one with little houses, and below that, one with super-bright crayon-colored trailers. When I’ve looked down at the town from the water tower hill, I couldn’t figure out where the street with those trailers was and how one got to it. That third leg of Juniper was hidden by the wall of dirt. In other neighborhoods, I’ve food an orange-and-blue building, stone buildings, a yellow house with Lady of Guadeloupe murals, little hidden cottages behind other houses, magical gardens, art gardens, hoarder yards, collapsing houses, yards with so much trash in them I worried how people could live that way, serene little adobe apartments with winding paths and desert gardens, and many of these coexist on the same streets. No pattern. The appeal of T or C to artists and musicians makes sense. It’s not neat, cute, or pretty, but it makes your neurons bushy. The recent exposure to so many new off-beat places seems to have broken my habitual perceptual patterns. I discovered a perfect spot for outdoor yoga in the courtyard outside my apartment that I never noticed as such, though the small square of bricks was always there. 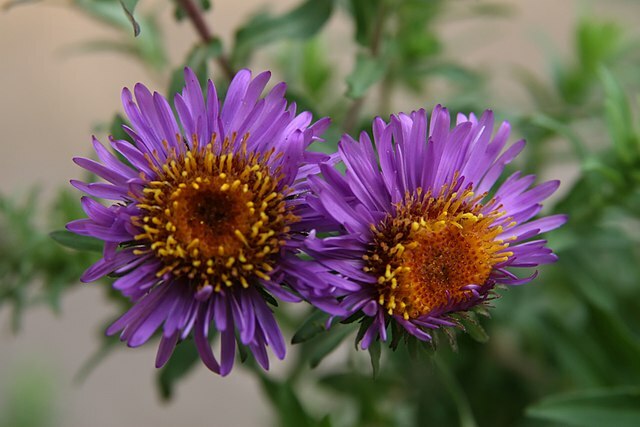 Smooth and flat, partly shaded, it faces the autumn-yellow fig tree and a tall purple aster. Yoga feels more spiritual under the open sky with nature around me, even if it’s nature in the courtyard. And the shapes of the fig tree and the flowers reminded me what the novelty was doing for my neurons. Read more of Amber Foxx’s essays on this blog and in the collection Small Awakenings: Reflections on Mindful Living.